1. The Panel has considered the planning proposal, which would quadruple the density specified in last year’s specific amendment of Division 7A of the Pittwater Local Environmental Plan 1993 (the LEP), as it proposes to increase the dwellings currently permissible on the sites subject to the proposal from 151 to 626. 2. The Panel cannot see any justification to depart, to this large extent, from a plan that was made only a few months ago and is based on the recent Warriewood Valley Strategic Review, undertaken jointly by Pittwater Council and the Department of Planning and Infrastructure. 3. The Panel notes that the densities nominated in the LEP would produce a residential character of two to three-storey medium density development of mainly townhouses. The planning proposal would produce a different and denser residential character of apartment buildings of four storeys. 4. If the proposal proceeds in its present form, and in the absence of a strategic review of the whole of the Warriewood Valley, it has the potential to set the precedent for all undeveloped residentially zoned land in the Valley. 5. For the above reasons the Panel unanimously recommends that the planning proposal should not proceed to gateway determination. As yet there have been no assurances from the Director General of the Department of Planning that they will honour the Warriewood Valley Review adopted in June of 2013 developed in consultation with the NSW Department of Planning and Infrastructure and residents fear a statement made by Mr. Sam Haddard at that time ‘for flexibility on densities in the future’ intimate even the JRPP will be ignored. Gateway reviews may be requested by a council or proponent following a gateway determination by the department, but before community consultation on the proposal has commenced. Under the Gateway system introduced from Friday 2 November 2012, the Minister (or delegate) determines whether the planning proposal is to proceed. A statement from a Meriton spokesman this week seems to indicate, at this stage, they will make such a request despite the JRPP’s pre-Gateway recommendation. On 7 June 2013, a Planning Proposal was lodged with Pittwater Council for the construction of up to 98 dwellings per developable hectare on 5 storey blocks of flats on two separate sites in Macpherson Street and three in Warriewood Road. Pittwater Council rejected the application on 2 September 2013, so the developer then went through the Government’s Gateway process, which saw Pittwater council’s decision scrutinised by the head of the Planning Department and the Minister. “Millions of dollars and months of time were spent on ‘your’ Strategic Review, which residents assumed gave them certainty. But the Director General of Planning and the Minister think otherwise. Now, all we’re asking of the Minister is the opportunity to meet with him to express our concerns. “Our message to you, Mr Hazzard, is that this community is important and we feel betrayed by a Minister who insists that the main reason for rewriting the planning laws is to ensure the community is fully informed and involved from the very earliest stages of all development applications. “That may be the theory, Minister, but it certainly isn't the practice. Your Strategic Review and LEP obviously aren’t worth the paper they’re written on. And hiding behind your department is not good enough". 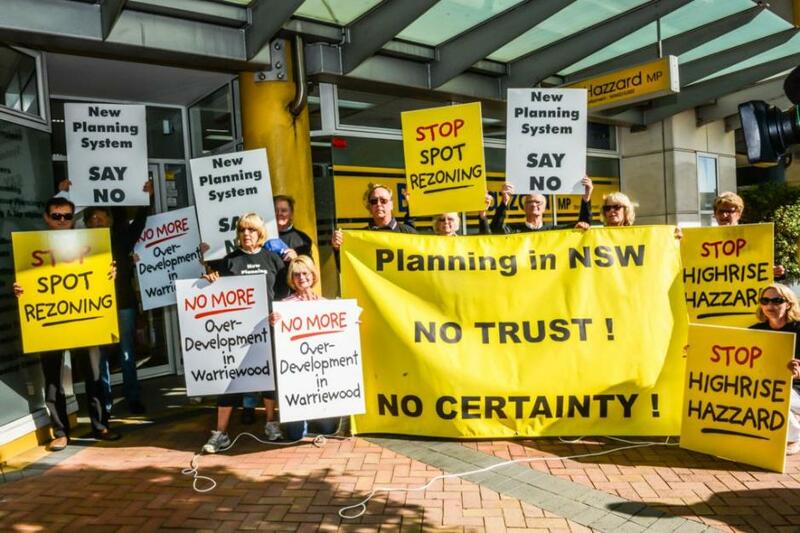 On Saturday 8th of February the Warriewood Residents Association held a meeting at Pittwater RSL to which members of the community were invited for a community workshop to find out how you can help to stop rampant overdevelopment in Warriewood. Angus Gordon commenting on the planning decision process at this meeting; "Why is it not possible for the community to get a seat at the table." Member for Pittwater Rob Stokes today welcomed the determination by the Joint Regional Planning Panel to refuse the rezoning of key areas of the Warriewood Valley. Earlier this week the Panel unanimously recommended that a controversial proposal to increase the allowable residential density of land at 2 and 18 Macpherson Street and 23-27 Warriewood Road should not be permitted to proceed. The proposal was found to be inconsistent with the permissible densities agreed to in the recently completed Warriewood Valley Strategic Review which was undertaken as a joint project between Pittwater Council and the NSW Government. "The expert panel has made a sensible decision which is completely in line with our community’s expectations," Rob Stokes said today. "The proposal is wildly inconsistent with the densities our community agreed to in the recent Strategic Review and its size and scale has caused concern amongst many local residents. “The purpose of the Joint Regional Planning Panel is to depoliticise the planning system and ensure that decisions are both expert and independent. "We have a comprehensive plan in place to ensure future development in the Warriewood Valley is undertaken methodically and appropriately and it's essential this is respected. “It now falls to the Director General of the Department of Planning to listen to the advice of the panel when determining whether this proposal proceeds,” Rob Stokes said. An application seeking to increase the development potential for 23-27 Warriewood Road Warriewood has been unanimously refused by Pittwater Council at its meeting this week. The application – for a unit development of up to five storeys and a density of 98 dwellings per developable hectare - was lodged in June on behalf of Karimbla Properties Pty Ltd, which is linked to the Meriton Group of companies. The Council refused the application citing its departure from the ‘orderly planning process’ outlined by the Warriewood Valley Strategic Review which was adopted by the Council in June 2013. The Strategic Review was jointly prepared by the NSW Department of Planning & Infrastructure and Pittwater Council as a means of planning for the remaining undeveloped land in the Warriewood Valley. The Review, completed after 18 months with extensive input from the community and independent consultants’ reports, recommended a maximum dwelling density of 32 per hectare, up from the previous 26 per hectare. The application sought for 23-27 Warriewood Road exceeded this recommendation by almost three times. Mayor Jacqui Townsend and Cr Julie Hegarty both declared an interest and withdrew when voting took place on the proposal, due to their positions on the Joint Regional Planning Panel. Deputy Mayor Bob Grace, speaking after the meeting, said the Council would now seek an urgent meeting with local MP Rob Stokes over the development proposal. 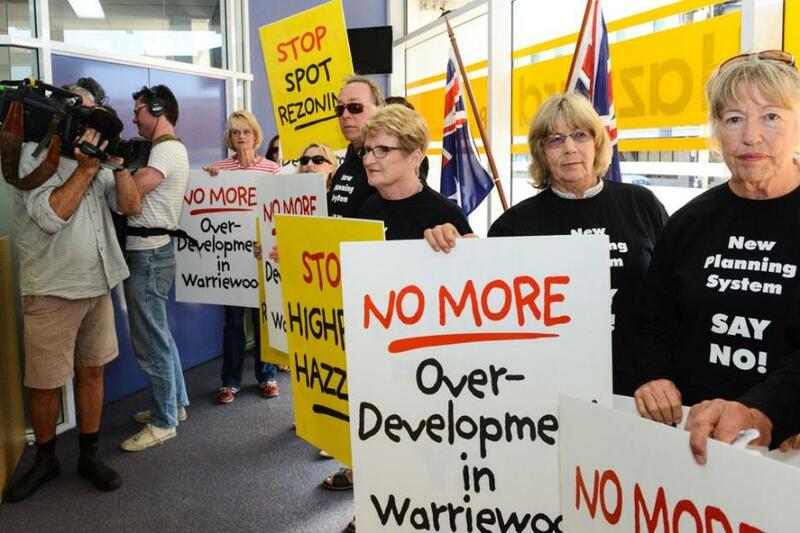 “It’s our belief the developer will now seek what’s called a pre-gateway review of the Council’s decision by the NSW Department of Planning, which could potentially overturn our refusal and the recommended densities of the Warriewood Strategic Review,” he said. “Given the community’s unrest over the government’s planning reforms and the extent of consultation that went into the Strategic Review, we believe this cannot go unchallenged. We will be seeking an urgent meeting with the Planning Minister Brad Hazzard to seek his reassurance that he will not use his powers to overturn the Council’s refusal of the planning proposal. Cr Grace said that the community, Council and the Department have agreed on the future densities of Warriewood Valley after an exhaustive process over the last 18 months. “Council has rejected a development which is totally inconsistent with these agreed densities and Council’s decision should be supported by the Department and the Minister,” added Cr Grace. Pittwater Council adopted the Warriewood Valley Strategic Review Report at a special Council meeting held last night. The review was carried out during 2011 and 2012 in a partnership between Pittwater Council and the NSW Department of Planning and Infrastructure. The review has examined the development potential of all undeveloped land remaining in the Warriewood Valley. Independent consultants took into account flooding issues, urban design, transport and traffic scenarios and the economic viability of undeveloped sites in the Valley for the strategic review. The review report has recommended 32 dwellings per hectare for most undeveloped sites, up from the current 25 per hectare. However the Council has rejected a call from the Director-General of NSW Planning Sam Haddad for flexibility on densities in the future. Mayor Jacqui Townsend said while she was pleased that there was now a clear way forward for development in the Valley, the Council was against any suggestion that densities could be increased. Mayor Townsend said future housing types in the Valley would include a mix of small lot housing, low-level apartment buildings, townhouses and terraced houses and would allow properties in Fern Creek Road and Orchard Street to be rezoned to residential. No changes were proposed however for the area known as the Southern Buffer, which extends from Boondah Road to Jacksons Road up the perimeter of Warriewood Centro. Mayor Townsend said that landowners in the Southern Buffer would need to investigate future redevelopment opportunities for their land, with development applications to be assessed by the Council. Report by A J Guesdon, Pictures by Michael Mannington, 2014.